"Tom, you won't believe what I saw at the Cracker Barrel!" "A man in a wheelchair being helped by a 'service monkey!'" "Yeah, right... a monkey...where...on his back?" Ok, so maybe the conversation didn't quite transpire as above but can you really hold it against me that I didn't, at first, believe in such a thing as 'service monkeys?'" C'mon, to me a service monkey was as plausible as a flying monkey! Where are we... Oz? But service monkeys DO exist! The first memory that pops into my mind when someone mentions a monkey is from my youth. A friend owned a spider monkey that escaped from its cage and totally trashed his home! In retrospect, however, he shouldn't have owned a monkey in the first place because he had no idea whatsoever how to care for this exotic animal. All that aside, what I've discovered in my research is that 'service monkeys' a.k.a. 'helper monkeys' do exist and aren't a fabrication of Hollywood B films like Monkey Shines. The main type of monkey being trained for this work is not the spider monkey, but the Capuchin monkey who is considered the most intelligent of the species. Capuchin monkeys typically weigh between 5 to 7 pounds and, after the socialization and training process, they allow people who have severe disabilities (e.g. quadriplegia, spinal cord injuries, and mobility issues) maintain their independence. These monkeys progress through a rigorous training agenda that includes living in the home environment with people and pets, as well as learning the daily tasks and enduring disturbances that may arise within the home. The organization that has provided a number of service monkeys to qualifying people around the country free of charge is called Helping Hands (est. in 1975). Monkey helpers are not for everyone, but people who have monkey helpers seem to love them and the friendship they provide. A list of strict requirements must be met, however, in order for someone to own a service monkey. 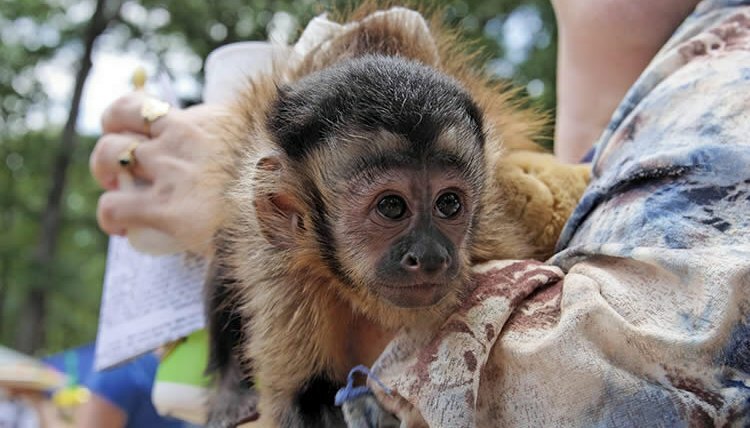 Helping Hands actually breeds capuchin monkeys at their breeding colony in Mendon, Massachusetts. These monkeys are then placed with foster families in socialization homes. There, the monkeys learn how to safely live with humans and pets. "Our monkeys have been raised since birth in human homes, and like any animal, if our staff and recipients learn and respect the animal’s hierarchy and natural behaviors, and maintain a safe, trusting environment, monkeys are very unlikely to feel the need to bite or scratch." When the monkeys mature to around 10 to 12 years of age, they leave the socialization homes and begin training at the Helping Hands Monkey College in Boston. Yes, you heard me correctly... the monkeys attend college! Monkey college typically lasts between 3 - 5 years and, while there, they learn how to perform daily tasks that will allow the disabled to maintain their independence. Are Monkeys Better Than Dogs? All service animals have their functions, but monkey helpers have distinct advantages over dogs when aiding people with certain disabilities. For most people, the traditional service dog will be sufficient and Helping Hands recommends you stick with service dogs if you like to take your animal with you everywhere. The reason for this is that monkeys must be in a safe and stable environment at all times—which isn't guaranteed out in public. As a result, public exposure of service monkeys is not recommended. People suffering from dog fur allergies obviously cannot have a service dog. But monkeys have hair, not fur, so allergies usually aren't a problem. Some individuals need a great deal more aid than a dog can offer. Monkeys can learn many more complicated tasks than dogs and other animals and they also learn very quickly. And what can they do? Monkeys can climb a bookshelf to retrieve a book, open it, and even turn the pages for the reader. They can scratch itches, adjust eyeglasses, open water bottles, turn computers/televisions/lights (anything with a switch!) on and off. The list goes on and on. Monkeys live a long time—up to 30 - 40 years! That's very long compared to a dog or other service animal. Keep in mind, though, that a monkey is much like a small child and must also be cared for, fed and bathed. People with severe disabilities may not be able to care for a service monkey and these situations must be considered and resolved. Monkeys are always considered to be part of the Helping Hands family, so if they're no longer able to stay at a recipient's home or they reach a ripe old age, then they are placed in retirement homes with people willing to take good care of a loyal monkey who's cared for the disabled all its life. Individuals interested in applying for a Service Monkey should visit the Helping Hands website. But don't delay. The seven-step application process takes between three to six months to complete—and that's without monkeying around!